As I already mentioned in the Post Javacrucianism and A magick Potion: Coffee, Coffee is due to its sociallytrained psychological component and other reasons a magick Potion. The Effect of the first coffee in the office or a Coffee after a long meeting is caused by more than just the actual Fluid. This enhanced effect can well be called magick or magickal. Most people will not admit this to be magick, but most people have no Idea what magick really is. I have made some tests to enhance the magick in this Potion and had a lot of fun doing so. 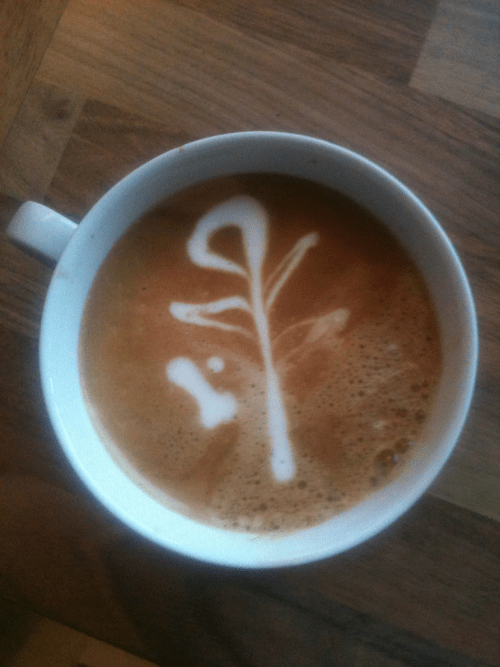 Latte Art is probably not known to everyone, so what is that? Now lets combine this! The most difficult part is to design a Sigil that can be drawn by latte art. You have to get accustomed to the technique of drawing with milk, this will do the quality of your Cappuccino a lot of good, so you should do this anyway. Funny enough the most common error is to foam the milk wrong. If you need a spoon to get the Milk out of the pot and it is like whipped cream, thats wrong. Hold the (metal) Milkpot with your hand so that you can feel the temperature, if it gets too hot to hold comfortably its done. The Cream must be pourable (as can be seen in the Youtube Video linked above). If the milk is right, you are 3/4 there. The Design of the Sigil should be made like a tree with leaves or similar easy design, the picture above was just poured and no stencil or tools where used. The whole thing should be performed in a mood as described so nicely by Robert Anton Wilson (Javacrucianism) and when you imbibe youre sigil do not forget to think and utter a clear “Ahhh”. Btw. the most common sigil is the sigil of Love (a heart) and if you pour it for youre loved one every now and then it greatly enhances the chances of having a fullfilled sexual life (or evening). ~ by Otto on February 13, 2012. YEAH, was an interesting post – coffee and the magic pictures – of coffee milk. What can you join in your eyes – an organ of perception. But you are looking – all what you see – is, recognizes the beautiful crema coffees as the Fibonacci, sunflower. Well that’s also magic, or??? I continued reading because i hhoped for some detailed definition of the coffeemagick. But maybe i knew it anyway by myself. I did give a lot of hints in the two other coffee related posts. The problem is, I want to point to techniques without heaving my interpretations over to others. But at least this is true lifestylemagick.